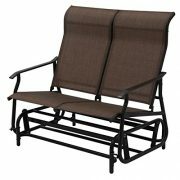 A comfortable, ergonomic design great for relaxing in your patio or garden for hours. Sleek, minimalist aesthetic lets this glider fit in with any environment. Glider structure allows you to gently rock back and forth. Synthetic fabric provides durable, strong, and waterproof fabric that’s easy to clean and made to withstand outdoor conditions. 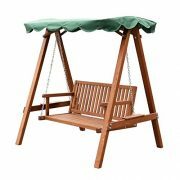 Sturdy steel frame ensures that this glider is high-quality and built to last. Overall Dimensions: 41.3(L) x 23(W) x 36(H). Seat Dimensions: 38(L) x 21(W). Floor-to-Seat Dimensions: 16.5(H). 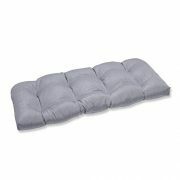 Backrest Dimensions: 38.5(L) x 19.5(W). 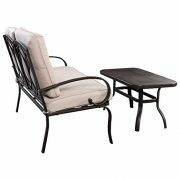 A great addition for any patio, backyard, or garden, this glider is perfect for two people to enjoy some time watching the world go by. Built to last and look good doing it, the waterproof textiline fabric is comfortable and easy to clean, while the powder-coated finish steel frame ensures reliability and longevity. Textilene fabric provides durable, strong, and waterproof fabric thats easy to clean and made to withstand outdoor conditions. 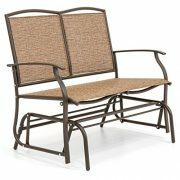 Sturdy steel frame ensures that this glider is high-quality and built to last. 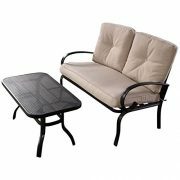 Comfortably seat all of your guests outside with this Outdoor loveseat and table set. Ideal for parties or just family get-togethers, you’ll always have the perfect place to relax outside. Includes: One (1) Loveseat, One (1) Table. 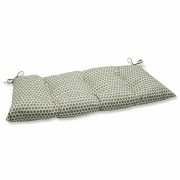 Cushion color: Beige, silver, white, teal. 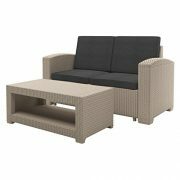 Wicker finish: Multi-brown, grey, black. Upholstery material: Fabric. 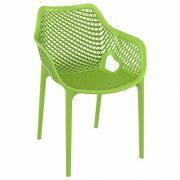 Material: PE wicker, iron. Note: Decorative pillows not ilncluded. 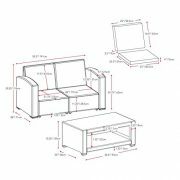 Loveseat dimensions: 33 inches high x 43 inches wide x 24.5 inches deep. 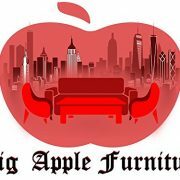 Table dimensions: 16.25 inches high x 17.75 inches wide x 34.25 inches deep. 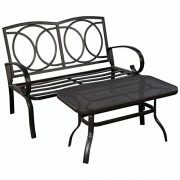 HIGH END FRAMES – We use aluminum frames, which is used in high end patio furniture. Steel and Wrought Iron rust, also damaging the furnitures structural integrity. 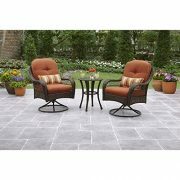 For patio furniture that lasts, aluminum frames is the best option. 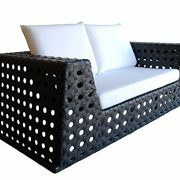 LONG LASTING MATERIALS – The #1 cause of wicker degradation is sunlight. Often retailers will use wording such as all-weather, meaning it will hold up to poor weather conditions only. Our resin wickers are UV coated to ensure you have a long lasting product. SUNBRELLA FABRICS – The best name in patio furniture fabrics. 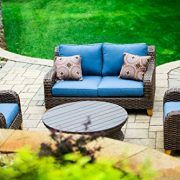 High end patio furniture companies such as Lloyd Flanders & Gloster use Sunbrella fabrics. 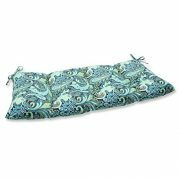 Standard retail cushions are made from spun poly fabrics which are not ideal for outdoor use. 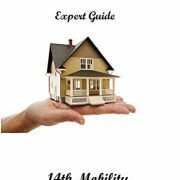 Sunbrella carries the best in industry 5-year limited warranty. 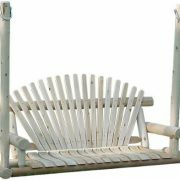 ~Color: White Wash. Natural color of rattan has a beige tint. 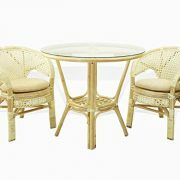 We paint rattan in white, polish it – and only after this process we can achieve a White Wash color. 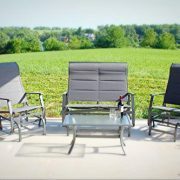 Brand new and high quality / Modern simplicity design, stylish look, suits a range of tastes and preferences / Strong steel tube frame and durable fabric ,sturdy and comfortable ,which are of contemporary looks and flavor, offers comfortable and exceptionally stunning outdoor lounging / An inset panel of thick, tempered glass fixed by Power-Grip suction cup to give you a surface that’s durable and easy to clean. 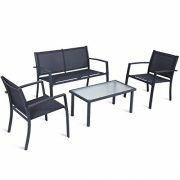 This Beautiful 4-piece Patio set will be the centerpiece of any outdoor gathering. 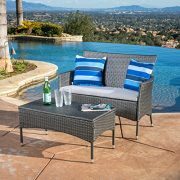 Perfect for your patio, porch, or even by the poolside! 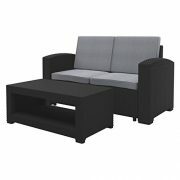 Includes a spacious love seat, 2 chairs, 1 coffee table, and 8 water resistant cushions. 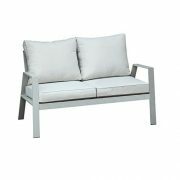 The seating area is constructed of aluminum frames, and PE Black Rattan, with comfortable Grey cushions.